Just as a snack or a breakfast on the go! 1. In a large skillet, cook diced sausage. Drain and set aside to cool. 2. 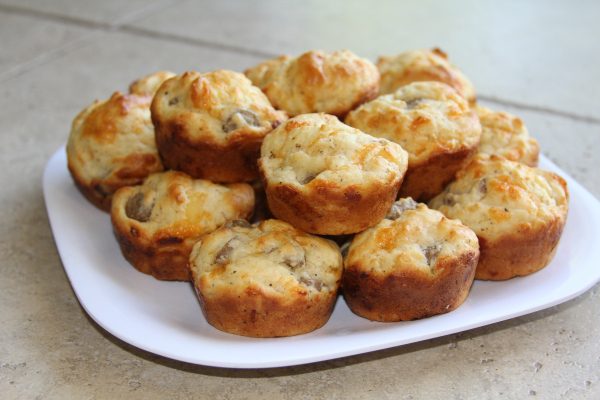 In a large bowl, combine baking mix, cheese and cooled sausage. Make a well in the center and add soup which has been pre-mixed with the water. Stir gently until well mixed. 3. Fill pre-greased muffin pans almost all the way to the top. 4. Bake in a 375 oven for 20-25 minutes until golden. 5. Pull out of the oven and brush with melted butter after 5 minutes.